People hate Superman because he’s an alien. The X-Men get giant robots sicced on them because they’re mutants. Racial prejudice has informed the subtext of loads of storylines in superhero comics. But Power Lines moves it to the foreground, giving people who hate each other powers and abilities beyond those of mortal men. Out this week from Image Comics, Power Lines #1 is the creation of longtime writer/artist Jimmie Robinson. He’s best known for raunchy, slyly subversive series like Bomb Queen and Five Weapons, and his work generally aims squarely at the popcorn tastes of a mass market audience. Power Lines shares the same broad thematic approach as Robinson’s other work but is grimmer and more grounded in tone. 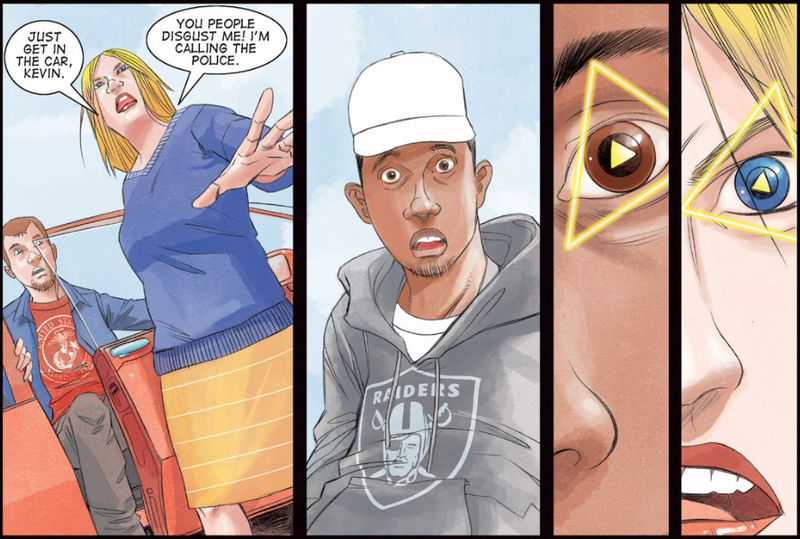 Make no mistake: Robinson deals in stereotypes in this first issue. Main character D-Trick is straight out of Menace II Society or another 1990s hood flick, a low-level street dude who’ll be going to college soon. The same goes for suburban mom Sarah Bellingham, who spews the kind of rhetoric heard from right-wing conservatives. There’s even a Native American shaman on the fringes of the action, empowered with historical knowledge about the mysterious powers that suddenly flare up for D-Trick and Sarah. The dialogue and character types are heavy-handed here, but they also reflect the cantankerous discourse that’s been on the uptick in America right now. There are signs that Robinson plans on humanizing the characters, though. D-Trick gets annoyed when one of his boys steals a purse from a neighborhood they were only supposed to tag up. Sarah saves her son from getting beat up. These people act in distasteful ways but they’re not irredeemable. If Power Lines stumbles, it could be a superhero version of Paul Haggis’ 2004 movie Crash: something well-intentioned but so flawed in execution that it doesn’t matter what it’s trying to say. But if it executes well, it could be an intriguing look at what superhero power fantasy looks like through the prism of the present day.